Banqueting men and women, Tomb of the Triclinium, near Tarquinia, ca. 470 BCE. As preserved in a watercolour made in 1895 by Gregorio Mariani. Paintings from Tarquinia provide ample evidence of elegant Etruscan ladies reclining with men on banquet couches amid festivities, with musicians, dancers, and youthful naked servants bringing food and drink. 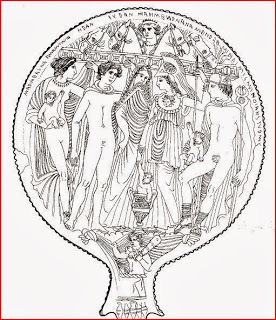 In contrast to the male world of the Greeks and the Roman paterfamilias, the Etruscans included the women of the ruling noble families in their public life. Such mingling of the sexes seemed, in their eyes, to be a serious breach of decorum which could only lead to gross indecency ... and worse; much worse. According to Livy, the wives of the Tarquins played a major role in acquiring royal power for their husbands. Tanaquil, wife of the first Tarquin, could foresee the future and so urged her husband to leave Tarquinia and seek his fortune in Rome: they worked together to get him chosen as king. Her prophetic ability helped, but she could also plan and plot with the best of them: later, by covering up the violent death of her husband, pretending he was still alive and issued orders, she bypassed the true heirs and raised her son-in-law Servius Tullius to the throne. The deeds of his younger daughter, Tullia, in turn, show off Etruscan muliebris audacia ("the daring proper to a woman") in the most dramatic ways possible. Our Lady Macbeth could take lessons from Tullia. Tullia murdered her sister and then her own husband in order to marry her brother-in-law, Lucius Tarquinius, whom she pushed into taking over the throne. To accomplish this, she went so far as to drive her chariot over the body of her father, King Servius Tullius, spattering herself with his blood. This was going a bit far, and eventually led, in 509 BCE, to the overthrow of the monarchy. Her husband is thus the last king of Rome. He, his murderous wife, and their sons were sent into exile to the Etruscan city of Caere, not far from Tarquinia, where they continued to make mischief for the new Roman Republic. I can well imagine Tanaquil or Tullia being buried with a spear by her side. Or any other of their female kin, for that matter, who displayed a lively dose of muliebris audacia. As inspired by the image of the Etruscan goddess Menarva (Minerva/Athena), perhaps. Well, that's how the Prince from Tarquinia became a Princess. And not just another pile of ashes. Ancient women are so confusing! * The designation of the largest tomb in Tarquinia as the "Queen's Tomb" is entirely conventional. No human remains, male or female, have yet been discovered. 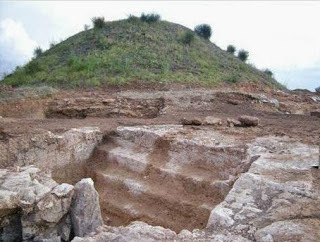 The tumulus covering the tomb is 40 meters in diameter, similar to that of another monumental tomb, 200 meters/yards away, the so-called King’s Tomb. Hence, the conceit of King and Queen. A staircase descends about 7 m (left) into a room built from large limestone blocks. Some of the walls were covered in a gypsum plaster that has close parallels in Cyprus; the crypt's design resembles the royal tombs of Salamis on Cyprus. A horizontal band of red paint once ran around the walls, a treatment that also appears in the new tomb from Tarquinia. On recent excavations in the Queen's Tomb, see 'Etruscan Necropolis Yields Fresh Discoveries', 05 August 2010. ** Despite intense searching, the only notice I've come across appeared in Roman Bioarchaeology Carnival 33 on Kristina Killgrove's blog, Powered by Osteons, on 30 September -- which linked to the Italian report in Viterbo News 24, with Prof. Mandolesi's response. I warmly thank Dr Killgrove for the reference, which certainly got my attention. Sources. In addition to those cited in the post, I have made much use of L. Bonfante, 'Daily Life and Afterlife', Ch. VII, in Etruscan Life and Afterlife: A Handbook of Etruscan Studies (Detroit, 1986), 232-254; V. Izzet, 'Etruscan Women: Towards a reappraisal', in (S.L. James, S. Dillon, eds.) A Companion to Women in the Ancient World (Blackwell, 2012), 66-78. I also happily credit two posts from Rosemary Joyce's blog, Ancient Bodies/Ancient Lives for their inspiration: Ancient Women Are Confusing and Powerful Women Existed in Moche Society: Now Move On.